The board fences along our trail are both functional and beautiful, protecting trail users while blending with the natural surroundings. FLMSP volunteers work to keep the fences cleared of vegetation, but sometimes more is needed to keep them strong and looking good. That's where the Fence Crew comes in. Recently they repaired this fence at mile marker 23.1 near Fort Ancient. Pictured above are Rich Easterly and Rod Gossett. George Stockham helped and took the photo. Vital to the safety of trail users are the wood fences placed along the trail where there are dangerous drop-offs. 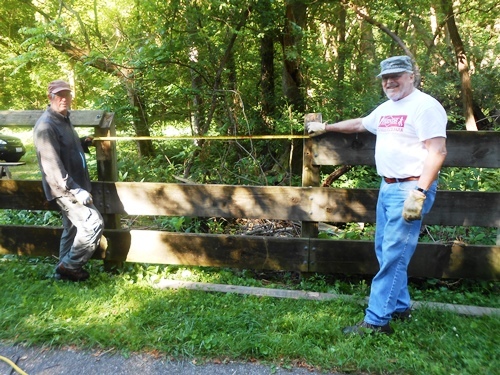 The Fence Crew had a bigger job when they replaced a guard fence north of South Lebanon at Plum Run. Here there is an approximate 15-foot drop from the trail surface to the exposed rocks in the stream below. 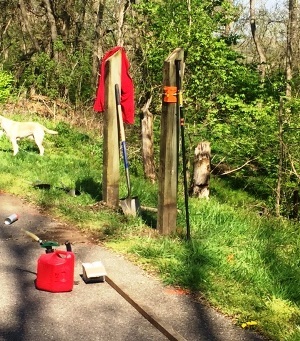 The first photo below shows the beginning of the work with two upright posts set in place. 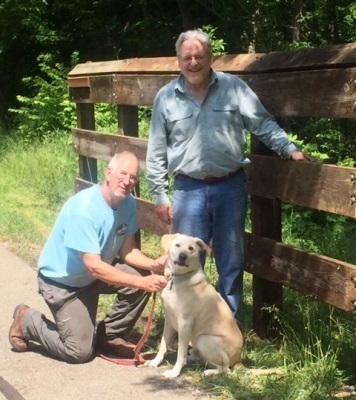 The second photo shows the finished product, Rich Easterly with Cody, and Rod Gossett. Not pictured is Ray Jacobsen. Thank you, Rich, Rod, Ray and George for your fine work.